This photo of the November 2006 transit of Mercury shows the rocky planet as a clean-edged disc in the lower hemisphere of the sun. Sunspots can also be seen near the right and left edges of the sun. Amateur astronomer and retired chemistry teacher Patricia Totten Espenak has published a book about the 2017 Great American Eclipse called "Total Eclipse or Bust! A Family Road Trip." She is the wife of retired astrophysicist and NASA eclipse expert Fred Espenak. "It's cold; it's dark; it's time for astronomy." That might be what you think when it comes to viewing the stars and planets, but all those denizens of the night don't stop spinning when the sun rises and smothers everything in brilliant light. This NASA graphic shows the timing of a few major events during the Mercury transit of May 9, 2016. During the transit, you can marvel at how small Mercury is and how fast it moves. The innermost planet will march fiercely across the sun, and the true scale of the solar system will be revealed. Mercury will be just a speck moving across the solar disk. You'll wonder how it survives. If Earth were placed in Mercury's orbit, it would look only about 2.5 times larger than Mercury does. Our home planet is pretty insignificant on the scale of the solar system, too. 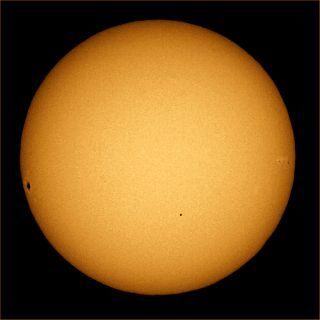 For observers in the western United States, the transit will already be in progress when the sun rises. To see the entire event, you must be east of a line that passes roughly from eastern South Dakota through eastern Louisiana. If a sunspot or two happen to grace us with their presence on transit day, then watching Mercury glide past these magnetic storms could be captivating. Since the invention of the telescope 400 years ago, there have been only 55 Mercury transits, and only about two-thirds of them would have been visible from the United States. So as you watch this leisurely celestial ballet, revel in the rarity of the event, and think of astronomers in days of yore, who sometimes traveled halfway around the world to witness such a sight. After viewing my first transit of Mercury in 1999, I asked, "When's the next one?" In this case, we're in luck, because the next transit of Mercury visible in the U.S. will occur in 2019. After that, there are transits in 2032 and 2039, but those will not be visible from the United States. Observers in the U.S. will have to wait until 2049 for another chance, so don't miss this one. You probably won't have to travel far to view this transit of Mercury, and perhaps it will whet your appetite to chase other astronomical events around the planet. At the very least, it might make you more aware of all those starry dancers silently swirling overhead, both night and day. Follow all of the Expert Voices issues and debates — and become part of the discussion — on Facebook, Twitter and Google+. The views expressed are those of the author and do not necessarily reflect the views of the publisher. This article was originally published on Space.com.